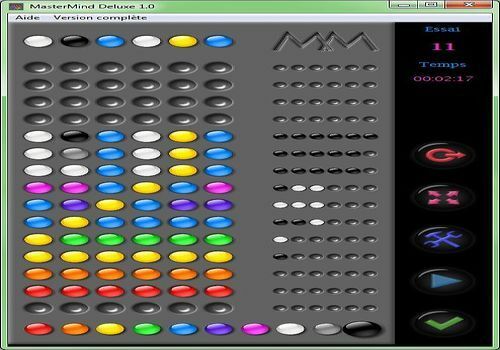 Mastermind Deluxe allows you to play the famous Mastermind game. guess according to your preferences. line (from 4 to 6) and the number of possible colors (from 6 to 10). The game is translated into 5 languages. resume the current game later. The best scores are recorded internationally by category. The goal of the game: a word search mix with the Mastermind, except that here you play with letters. Four difficulty levels: 6, 7, 8 or 9 letter word. SUmastermind: a superb remake of the MASTERMIND, (created by Mordecai Meirowitz in the 1970s). The Mastermind game. ! the combination is 4 colors among 10 available colors ! you can put several identical colors in the combination. Mastermind is a logic game. You must guess by successive deductions, the color and position of 5 pieces hidden in the top line of this game.